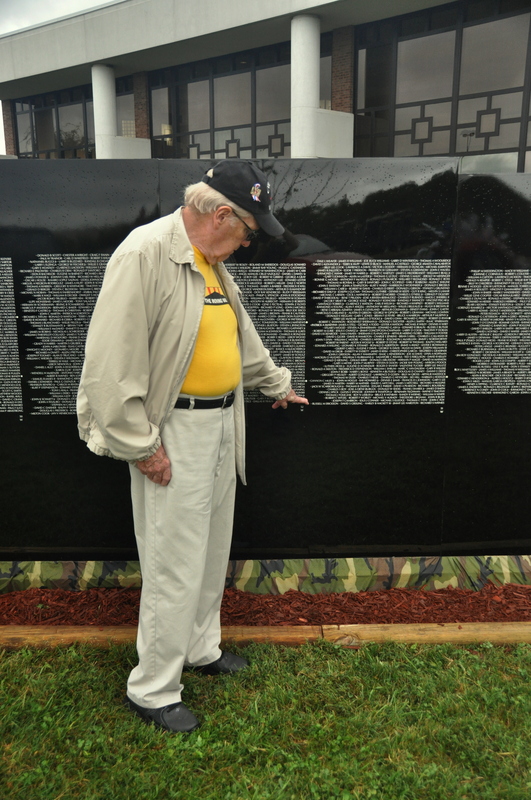 This past weekend, Morristown, TN, midway between Knoxville and Johnson City, played host to the Vietnam Moving Wall. A half-size replica of the Vietnam Veterans Memorial in Washington, DC, the Moving Wall has been traveling around the U.S. since 1984. I had the opportunity to attend the opening ceremonies, a dedication held in the Walters State Community College Lyceum behind the campus grounds upon which the Wall was displayed. 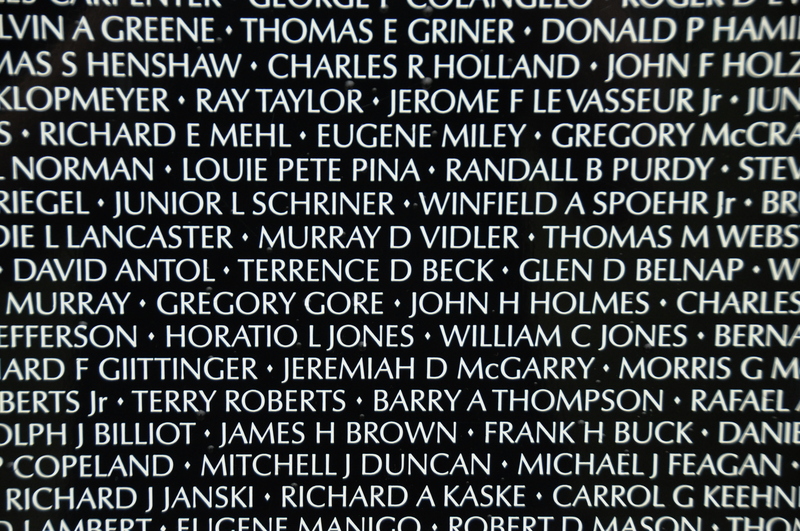 The Wall features the names of all 58,320 U.S. servicemen who were declared dead or missing in action in Vietnam. The names are listed in chronological order, from 1959 to 1975, over a series of 144 granite columns across a V-shaped plot. The full-sized wall in Washington, DC covers two acres. Also like the real thing, a tent staffed by volunteers hands out paper and pencils, with which you can “rub” the names of war dead onto paper as a personal memento. 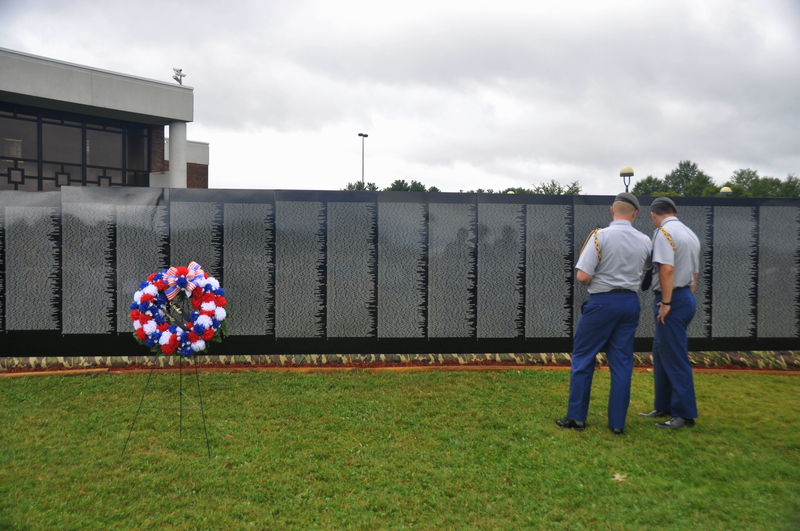 Each day at noon, the reading of all 1,295 Tennessee casualties takes place from in front of the Moving Wall. Although I don’t know for certain, I imagine that this is standard practice in other U.S. states as well. 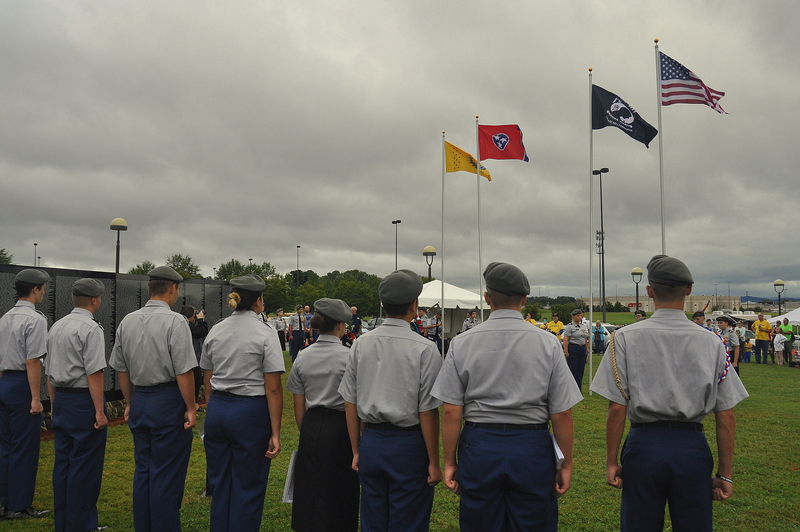 The opening ceremony also included the raising of the U.S., Tennessee, P.O.W., and Vietnam War Veterans flags, as observed by local ROTC students, with two student candidates posted on the grounds at all time. 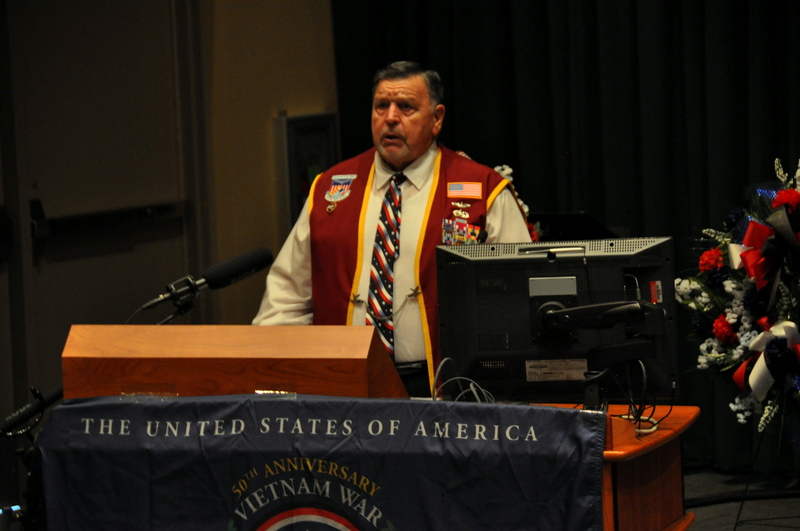 The opening ceremony on Thursday filled the auditorium to capacity, and I noticed several veterans in attendance. My father, who served in Germany during the early days of the Vietnam War, was one of the event coordinators, and had been on the grounds since 5 a.m. He made press rounds and the event had reporters from ABC-TV in Knoxville in attendance. After stirring renditions of the “Pledge of Allegiance” and the “Star Spangled Banner,” ROTC officers presented memorial wreaths from each county in the Lakeway area. The keynote speaker, former P.O.W. and retired Air Force Captain Bill Robinson, gave a moving speech about the importance of remembering those who perished. Captain Robinson was held captive in the Hanoi Hilton for over seven years, longer than anyone else. For nearly half of his 7+ years, Robinson was classified as “missing in action,” until the North Vietnamese government finally announced his imprisonment. He didn’t speak much at the opening ceremony about what his loved ones back home must have thinking while his status was unknown, and perhaps that is more telling than any words themselves. What, really, could you say? Captain Robinson, who was the subject of a book about his experience, “The Longest Rescue,” moved many in the audience to the brink of tears. By the time we joined presenter Sue King-Marschalk of the Daughters of the American Revolution in the singing of “God Bless America,” the dam burst. Although I don’t agree with many of my country’s policies, I think we do folk songs better than anyone. The ceremony concluded with the announcement that the honorary flyover was canceled due to inclement weather; a misty, on-again, off-again drizzle rang in the flag-raising event outside. Many in the audience lingered behind to shake Captain Robinson’s hand. 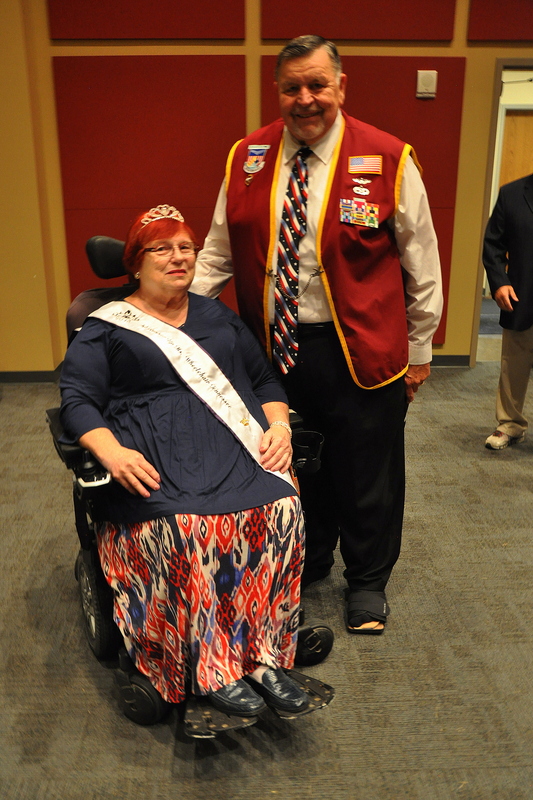 I captured a picture of the captain with a woman whom I know only as Judy – this year’s runner-up in the Miss Tennessee Wheelchair pageant. Judy, who was all smiles in her tiara as she handed out American flag pins, lives in the same retirement community as my father. I walked with my dad as he sought out the names of two people he knew who were killed in Vietnam. ROTC officers were on hand to help visitors find the corresponding panel. I kept my distance as I observed a man kneeling, in prayer or grief, perhaps, who had found the name of someone dear to him.